This post explains about the method of preparing GST Tax Invoice, Contents of GST invoice, process on how to make a GST Tax Invoice etc. An invoice is prepared under a sale transaction. If any sales occur, invoice is issued by seller to buyer. The details of seller and buyer with registration number if any, details of sales and other information are mentioned in a sale Invoice. However, if a Tax Invoice is required to be prepared, such Tax Invoice is issued based on the guidelines of tax authorities. 1. Name and address of the supplier who supplies goods or/and services: Here, the name and address of the supplier is mentioned. Normally, the registered office address is mentioned. However, if the supplier has offices in different states and supplies, the address mentioned for such GST registration address may be mentioned. 2. GSTIN number of the supplier: Registration number of GST, GSTIN must be mentioned on GST Tax Invoice. This number is a prime evidence that the supplier has registered with GST. The GST authorities can verify the details at any point during supply or post supply about such supply by referring GSTIN number. If such supply has not been uploaded by supplier, necessary measures can be taken easily by verifying GSTIN number. 3. GST Tax Invoice Number: Usually, invoice is prepared with consecutive invoice number. Here, in GST Tax Invoice also, a consecutive serial number containing only alphabets and/or numerals, unique has to be mentioned on invoice. The basic principle on how to prepare an Invoice has to be followed under GST Tax Invoice also. For example, if GST invoice is named with numeric number (only numbers) or alphanumeric (numbers and alphabets) it should be unique. Means, same number should not be similar to another one. Consecutive numbers are allotted to each invioce number as per time of issue of invoice. 4. Date of GST Invoice: Usually, GST number is provided based on the time of issue. So date of GST Tax invoice also is required to be given as per the time of issue (date of issue). 6. HSN code or SAC code in GST Invoice: HSN code means Harmonized System Number code and SAC code means Service Accounting Code number. You may click here to find HSN code of your product. This Link explains and lists about SAC code. Please click the said links to get your HSN code or SAC code of your commodity. The HSN code or/and SAC code has to be mentioned in GST invoice which helps to classify goods to compute GST as per slab fixed by the authorities. 7. Description of Goods or Description of Services: If goods are supplied, the description of such goods are mentioned in GST Invoice. In case of service supplies effected, the details of such service is mentioned in GST invoice. 8. Quantity to be mentioned in GST Tax Invoice: Another content in GST Invoice is quantity of goods or services. Unit of quantity also may be mentioned in GST Invoice. This information is same as Sales Invoice normally mentioned. 9. Value of Goods or services, total in GST invoice: Total value of goods or/and services is mentioned same as normal Sales Invoice. 10. Taxable value of goods and/or services in GST invoice: This information is important in a GST Invoice. Here, out of total value of goods or services, the amount taxable under GST Law has to be separately mentioned to compute and pay GST. So, both total value of sales and taxable value of sales have to be separately mentioned in GST Tax Invoice. If total value of sales and taxable value of sales, both can be mentioned as same by mentioning both in GST invoice. If any discount or abatement, such amount can be accounted before mentioning total value of sales. 11. Rate of GST Tax in GST Tax Invoice: The rate of GST is required to be declared when issuing GST Tax Invoice. Either CGST and SGST or CGST and IGST can be mentioned in such Tax Invoice depends upon the nature of transaction whether interstate supply or intrastate supply of goods and/or services. 12. Amount of GST charged: Once after computation of GST, such amount of GST imposed in respect of taxable goods or services need to be mentioned in GST Tax Invoice. Such amount of GST derived is mentioned separately as IGST, CGST and SGST wherever applicable. 13. In case of Interstate supply of Goods and Services: Place of supply along with the name of State, in case of a supply in the course of inter-State trade or commerce need to be mentioned in GST invoice. 14. Place of Supply in GST Tax Invoice: If place of delivery differs from place of supply of goods or/and services, such place of delivery has to be mentioned in GST Tax Invoice. When preparing GST Invoice, if GST is payable on reverse charges, such information about ‘GST PAID ON REVERSE CHARGES’ has to be mentioned in GST Invoice. 16. If Revised Invoice: If GST Invoice is a revised one, such information has to be clearly mentioned as “REVISED INVOICE” in GST Tax Invoice. Normally, the Invoice Number remains same as previously issued Original Invoice with changes in contents of Invoice. If any changes in Invoice number and date such information also to be mentioned. 17. If Supplementary Invoice: If GST Invoice is supplementary Invoice to previously issued Invoice, the word “SUPPLEMENTARY INVOICE to Invoice number… dated ….” has to be mentioned in GST Tax Invoice. 18. Signature of the Supplier or his authorized representative: A GST Tax Invoice has to be signed by the supplier or his authorized signatory. The signature can be a digital signature also as per the guidelines of GST authorities. 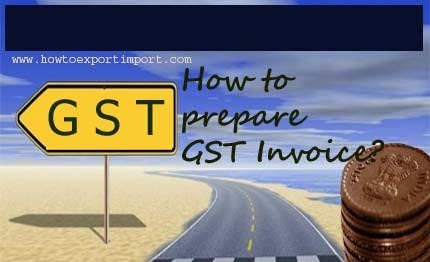 The above information explains on how to prepare a GST Invoice. The above post about issue of GST Invoice also describes the tips to prepare a GST tax invoice, contents to be mentioned in a GST Tax Invoice, and other guidelines to fill each column of GST Tax Invoice. Share below your views about this post on guidelines to issue GST Tax Invoice. anilkumar: On 30 June 2017 I want to know the bill format of resale in my home state after interstate purchase & the minimum % of profit.